This beautiful White Gold Hoop Earrings is beautifully crafted with Swarovski Crystals that will enhance any wardrobe choice making it the perfect gift for that special someone! Buying Jewelry can be scary, but not from Cate & Chloe! We Offer a 100% MONEY-BACK GUARANTEE, NO HASSLE RETURNS, & FREE SHIPPING ON EVERY ORDER. 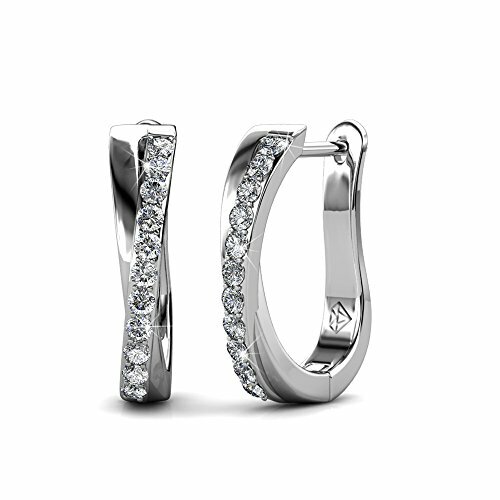 HOOP EARRINGS FOR WOMEN - These earrings are the perfect fashion accessory for any woman! These silver earrings will flatter anyone, with the beautiful crystals on these earrings it will be hard for people not to notice! FASHION EARRINGS FOR WOMEN - Are you hoping to impress the girl you have been dating a while with new jewelry? These earrings will be the perfect addition to any womens jewelry with its gold plating and beautiful crystal stones! RISK FREE MONEY BACK GUARANTEE - DON'T LOVE YOUR PRODUCT? CONTACT US FOR A HASSLE FREE RETURN. Unlike many others in the industry, Cate and Chloe values our customers, and if you are not happy we will make sure your product is returned free of charge to you!